IMS: Working with Guidelines (EBPG) and SOPs Orientation towards quality and continual improvement is a fundamental principle within Fresenius Medical Care and a key element of management policy for all business sectors. Within the Patient Care Business Unit, FME aims to set and achieve higher standards of dialysis care supported by both internal, corporate requirements as well as external standards. FME's overall approach to quality assurance is based on the principles of continuous quality improvement (CQI) as presented in the 1990 Institute of Medicine report 'Medicare: a strategy for quality assurance' . CQI is a theory; it is not a structure for an effective dialysis quality assurance program. In order to manage the practical implementation of these varying requirements the concept of an IMS was selected. With such a system it is possible to manage major internal process-related requirements, e.g. reporting in the clinical database, and simultaneously to fulfill the requirements of ISO standards and legal obligations. Two standards in particular are in focus, ISO 9001:2000 for the Quality Management System and ISO 14001:2004 for the Environmental Management System. In addition risk management is an essential part of the IMS. Under this framework, the CQI techniques are applied in conjunction with (mainly) internal and (where possible) external benchmarking in a system driven by quality targets. 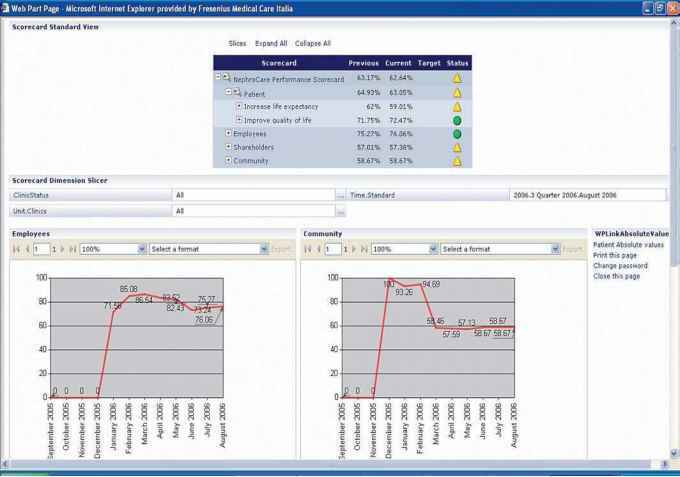 Benchmarking is obviously data driven and therefore, in the late 1990s a project was initiated to create a clinical database aimed to support quality assurance in FME dialysis centers located in Europe. Benchmarking and Monitoring Systems, the Role of EuCliD® 5, the Complete Therapy Information System The description of the first version of the database, named EuCliD® (European Clinical Database), has already been published . Right from the outset EuCliD® was structured to follow a logical information flow. During the last years the software has been updated and a new project based on an enlarged scope has been initiated. The new project was aimed not only to support quality assurance, but also to facilitate the day-to-day work of the clinical staff. Additionally, a major focus on patient safety aspects was included in the design input document. The result, EuCliD® 5, is a multilingual and fully codified software using, as far as possible, international standard coding tables (ICD10 , ISCED , ISCO-88  etc.). EuCliD® 5 collects and handles sensitive medical patient data, and ensures the confidentiality of these data . EuCliD® 5 has been approved by the respective national or regional authorities prior to data entry and the initiation of data transfer. Of course, the transfer of private patient data out of the dialysis center is not permitted. In summary the system collects and works on the following data. Patients: (a) admission (main demographics, anamnesis, comorbids, laboratory tests, treatment prescription, etc. ); (b) complete clinical follow-up including dialysis treatment (each session is recorded with all vital parameters collected with a direct interface from the dialysis machine); (c) pharmacological therapy, specialists' examinations, blood transfusions, carpal tunnel syndrome surgery, parathyroidectomy, etc. ; (d) laboratory tests with automatic calculation of some variables (including dialysis dose); (e) movements (holidays, transfers to other units); (f) key indicators of clinical outcome (morbidity with cause of hospitalization, mortality and cause of mortality), and (g) other specific local needs (pharmaco-vigilance). Dialysis unit: Personnel, facility installations (stations, water treatment, dialysis machines), resource planning (installations, purchasing, patient sessions). From the technical point of view, EuCliD® 5 is a web application which can be easily run with a browser without the need of any ad hoc installation on the local client. EuCliD® 5 relies on the Microsoft.NET framework, in particular the programming language used is C#, the database engine is Microsoft SQL Server 2000 and the reporting engine is Microsoft Reporting Services. To facilitate data collection related to the individual dialysis session a 'smart client' has been developed to work on a pocket PC which is WIFI-connected to the network. EuCliD® 5 has been interfaced with a Dialysis Management system, allowing the automatic import of data generated by the dialysis machine itself. In addition, different software interfaces for importing laboratoy data have been developed. Microsoft.NET framework allows only restricted access to information stored in the database. Sensitive information is encrypted at database level using the Advanced Encryption Standard (AES) which is an encryp tion standard of the US government. The Secure Socket Layer is used as a transmission protocol which due to its cryptographic characteristics is able to provide secure communications. All sensitive patient information is stored in a database encrypted according to the AES standard. Every night, all non-sensitive information is consolidated on a central database, permitting analysis of updated information on the following working day. Coming back to the CQI process, the targets should only be defined once the database is working and collecting high quality data, and a monitoring/reporting system based on clinical indicators derived from evidence-based clinical guidelines is in place. This allows the completion of the components in order to activate clinical governance. The discussion of the clinical targets is realized by a specific council, including the country medical directors. These targets consider quality and safety aspects. Under the quality domain, patient satisfaction , markers of quality of treatment, and markers related to outcome and also treatment options are included. According to European Best Practice Guidelines , high-flux HD and convective treatments are considered the top therapeutic options for the treatment of ESRD patients, but the increasingly high costs of these treatment options remain the main limitation, and only by redesigning the process by which care is delivered will it be possible to improve the quality of care and finally even reduce overall healthcare expenditure. This is the main reason justifying the introduction of the Balanced Score-Card (below). It is the only integrated approach which simultaneously considers all the different domains related to dialysis practice. In order to combine clinical governance with management targets, it is necessary to select a methodology which allows clear definition of goals and gives clear messages to all associates and stakeholders. Every country has its own specific legal requirements regarding dialysis. Fresenius Medical Care therefore decided to adapt the Balanced ScoreCard  methodology, which reconciles and tracks the strategic direction of the organization at any level (enterprise-wide, country-wide, single unit, etc.) using interconnected perspectives, objectives and key performance indicators (KPIs). Fig. 9. NephroCare ScoreCard: simulation of two perspectives in a newly integrated clinic. ideal model, based on local requirements and targeting maximum possible efficiency whilst having a unique target for patient outcomes as described in the European Best Practice Guidelines. The ScoreCard is also used to align the different country organizations around the same quality indicators. These indicators require the allocation of a responsible person, the creation of a project, a follow-up system, and a reward in case of success (fig. 9). The structure of the ScoreCard, with its perspectives, objectives and key performance indicators is based on the Quality Policy of Fresenius Medical Care. It acknowledges the company's responsibilities for its patients, employees, shareholders and communities (the 4 perspectives) and to justify these responsibilities it expresses Fresenius Medical Care's commitment to specific quality objectives. The patient perspective is the most important part of the ScoreCard and therefore has the highest weight. The two objectives within this perspective are to increase life expectancy and to improve the quality of life of patients treated within FME's network of dialysis centers. The selected KPIs focus on good clinical outcomes as well as on patient safety and satisfaction and their targets are based on the European Best Practice Guidelines and the consensus of FME's Country Medical Representative Committee. The objectives of the employees perspective and the shareholders perspective are to maintain qualified personnel and promote their professional development on the one hand, and to promote the continuous development of the company, thus obtaining attractive returns for the shareholders on the other hand. Therefore the selected KPIs focus on functioning personnel management and on well-established management processes and financial controls. The community perspective has as objectives the justification of FME's various social responsibilities, compliance with all legal requirements and safety standards and FME's contribution to the preservation of the environment. The focus of the selected KPIs is quite wide, ranging from minimizing accidents to employees, to the upholding of ISO certifications and the establishment of processes to save water, electricity and waste.